Also known as urban fruit trees, columnar fruit trees are basically trees that grow up instead of out, giving the trees a spire shape and a rather elegant appearance. Because the branches are short, the trees are well-suited to small gardens in urban or suburban environments. 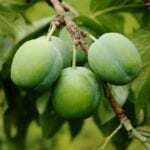 Read on to learn more about columnar fruit tree care. So exactly what are columnar fruit trees? Although growers are working to create a variety of columnar fruit trees, apple trees are currently the only type on the market. 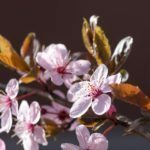 You can buy peach, cherry and plum trees that have an upright, narrow growth habit, but they aren’t true columnar trees. Columnar fruit trees are usually 8 to 10 feet tall at maturity, compared to standard trees that reach heights of about 20 feet. Spread of columnar apples trees is only about 2 to 3 feet. Apples grown on columnar trees are normal size, but a columnar tree produces less fruit than a standard, dwarf or semi-dwarf tree. Although they tend to be expensive, columnar trees can produce fruit dependably for about 20 years. Growing columnar fruit trees is fairly straightforward. 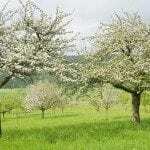 Apple trees are suitable for growing in USDA plant hardiness zones 4 through 8, which means they tolerate all but very hot or very cold climates. Be sure you can provide a place in full sun and that you have adequate space. Apples need pollen from a different type of apple tree to set fruit successfully, so you’ll need at least two trees of two separate varieties to provide cross-pollination. Plant the trees within 100 feet of one another so bees and other pollinators will visit both trees. Columnar fruit trees grow well in the ground; allow at least 2 feet between each tree. You can plant these fruit trees in large containers too, such as whiskey barrels. Water columnar apple trees regularly; the soil should be neither soggy nor bone dry. Feed the trees regularly, using either a balanced fertilizer applied throughout the growing season, or a time-release fertilizer applied once every year. You may need to thin the trees the first year so the branches will support the weight of the apples. Otherwise, prune only as needed to remove damaged branches.